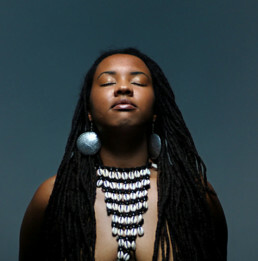 fayemi shakur is a writer, cultural critic and curator residing in Newark, New Jersey. Currently, she is a Visiting Lecturer at Rutgers University-Newark, Department of Art, Culture and Media. She is a mentor to artists participating in the 2019 NYFA Immigrant Artist Mentoring Program: Newark and a 2019 Feminist in Residence at Project for Empty Space. Her writing has been featured in The New York Times, Hyperallergic, The International Review of African American Art, Nueva Luz Photographic Journal and MFON: Women Photographers in the African Diaspora among other books and publications. Recently, she was selected as a 2019 Critical Studies Artist in Residence at the Center for Photography at Woodstock. Her recently published limited edition, 146-page risoprint artbook, “A Womb of Violet; An Anthology” features a collection of contemporary voices in poetry and art by Black women artists that pay homage to the work of Black feminist/womanist thinkers, writers and poets, and is now available at Project for Empty Space. Previously, she served as executive director at City Without Walls, a non-profit art gallery in Newark (2016-2017). She also served as marketing and public program manager at Aljira, a Center for Contemporary Art (2012-2016), and managing editor and contributing writer at HYCIDE magazine, an arts and photojournalism publication (2011-2012). She is also a co-founder of The Annual Lincoln Park Music Festival and a certified yoga and meditation instructor.